Before the damming of the Yangtze River in 1981, Chinese sturgeon swam freely each summer one after another into the river's mouth, continuing upriver while fasting all along the way. They bred in the upper spawning ground the following fall before returning quickly back to the sea. Now, researchers reporting in Current Biology on November 1 offer new insight into the threat the dams have since posed to the critically endangered fish. 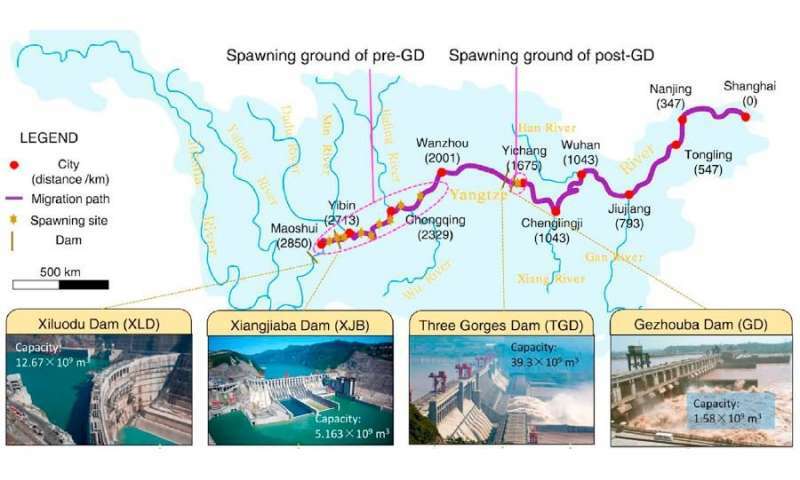 "We have established a novel theoretical framework to study the relationship between dams and the fish and to reveal the quantitative mechanism by which dams impact anadromous fish," says Zhenli Huang of the China Institute of Water Resources and Hydropower Research. "We have found that the loss of effective breeding and environmental capacity are two crucial factors resulting in an ongoing decline in adult abundances of Chinese sturgeon in the Yangtze River." The findings likely aren't unique to the Yangtze River, the researchers note. Most of the world's rivers have been dammed. Those dams have long been considered a serious threat to migratory fish around the world. But, scientists hadn't documented all of the ways in which dams affect fish. To explore in the new study, Huang and study co-author Luhai Wang combined field observations with theoretical analysis of historical data. They wanted to understand something that had already become clear: why the spawning activity of Chinese sturgeon had become more and more difficult to observe in recent years. The study shows that since 1981, the Gezhouba Dam has reduced the distance of the Chinese sturgeon's migration by 1,175 kilometers. As a result, the fish reach reproductive maturity more than a month (37 days) later. That's because the flow of water as fish swim upstream during migration is an important factor influencing sexual maturity. That delayed maturity has in turn reduced the effective population size, as there are fewer breeding individuals. The environmental capacity of the new spawning ground has also been reduced, perhaps by almost a quarter. The building of subsequent dams in the last 10 years has also led to an increase in water temperature, which is known to discourage spawning. Overall, the researchers report that the cascade dams have led to an ongoing decline in the number of adult sturgeon in the Yangtze River and the sea from more than 32,000 before 1981, to 6,000 in 2010, and about 2,500 in 2015. At this rate, they predict, the natural population of Chinese sturgeon will go extinct, perhaps as soon as the next decade. Despite a poor outlook for Chinese sturgeon, the researchers reserve hope that their findings will lead to targeted measures in order to maintain the wild population of endangered species of fish at an appropriate level. They say that lowering the water temperature to a suitable range of 18°C-20°C during the breeding season is undoubtedly the top priority. They're now working on a follow-up study to explore the dams' effects on the more complex migration of young sturgeon.